This baby is hungry, so when it's time to eat, add the food packet and water into the blender. Kids can turn the handle to really mix together their baby's meal! After feeding a baby with a spoon, give them a bottle - when the baby " poops" it's time for a diaper change. 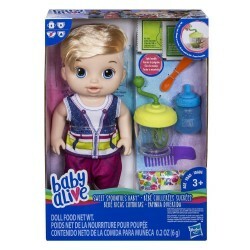 With a comb to style baby’s hair and sweet removable outfit, kids can play over and over again!